Figure A. FITC conjugated Mouse anti Human CD19 (MCA1940F) and Alexa Fluor 647 conjugated Mouse IgG2a isotype control (MCA929A647). 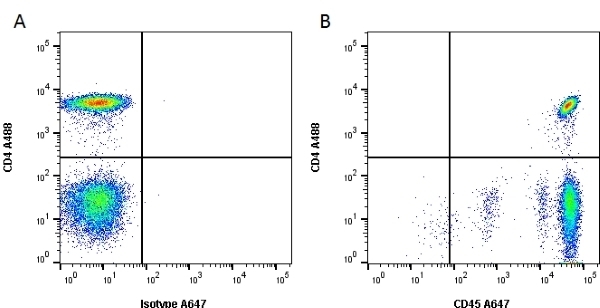 Figure B. FITC conjugated Mouse anti Human CD19 (MCA1940F) and Alexa Fluor 647 conjugated Mouse anti Human CD45 (MCA87A647). All experiments performed on red cell lysed human peripheral blood gated on leukocytes in the presence of Human SeroBlock (BUF070A). 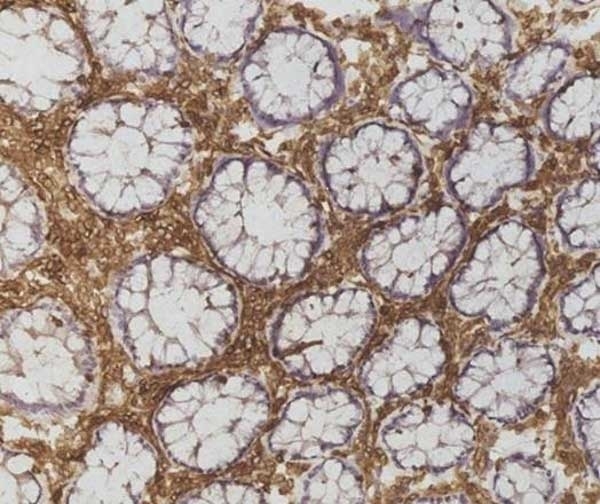 Detection of Mouse anti Human CD45 (MCA87) in an immunohistochemical analysis of an acetone fixed, frozen human colon section using the Histar Detection Kit (STAR3000A). Mouse anti Human CD45 antibody, clone F10-89-4 (MCA87) used for the evaluation of CD45 expression on brain derived mesenchymal stem cells. FACS sorting of brain-derived progenitor cell lines. 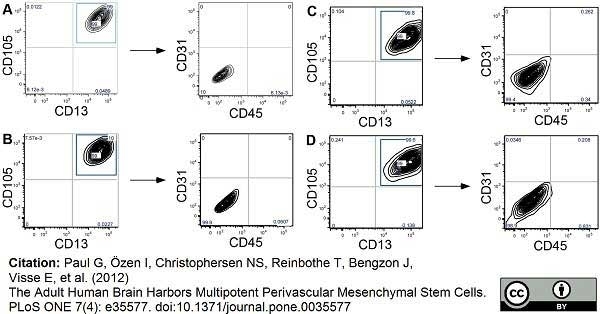 Human progenitor cells were positively sorted for the MSC markers CD105 and CD13, and thereafter negatively for hematopoietic (CD45) and endothelial markers (CD31). Histogram illustrates results (A, B) for the two different cortical lines and (C, D) for the two lines from the ventricular zone. 99.4–100% of the cell population expressed both, CD105 and CD13, and cultures did not contain endothelial or hematopoietic cells. From: Paul G, Özen I, Christophersen NS, Reinbothe T, Bengzon J, et al. (2012) The Adult Human Brain Harbors Multipotent Perivascular Mesenchymal Stem Cells. Mouse anti Human CD45 antibody, clone F10-89-4 used for the evaluation of CD45 expression on brain derived mesenchymal stem cells. Characterisation of clonal perivascular MSC progenitor lines. (A) Single cell in vitro a few hours after plating, and culture at 7 and 21 days, respectively. Scale bar 50 µm. (B) Clonally derived MSC show the same antigen profile as detected for polyclonal lines with pericyte and MSC markers but neither neuronal nor glial precursor cell markers (O4, GFAP) (example here cortical clone; green = isotype, red = respective marker). (C) QPCR comparing clones derived from the ventricular zone (n = 2), and the cortex (n = 2) to a human neuronal progenitor cell line MesC2.10. Data show the relative higher expression of mRNA for RGS5, PDGFR-β and α-SMA in the MSC clones compared to the control. As expected, Nestin mRNA was present in perivascular MSC clones and neural progenitors at comparable amounts. NG2 mRNA was slightly higher expressed in the MSC clones compared to the control. (D) Importantly, neural progenitors markers such as CD133, SOX1, NGN2, PAX6 and Musashi were highly expressed in the positive control but not detectable in MSC clones. Alexa Fluor A647 conjugated Mouse anti Human CD45 antibody, clone F10-89-4 (MCA87A647) used for the identification of CD45 expressing cells in blood samples by immunofluorescence. 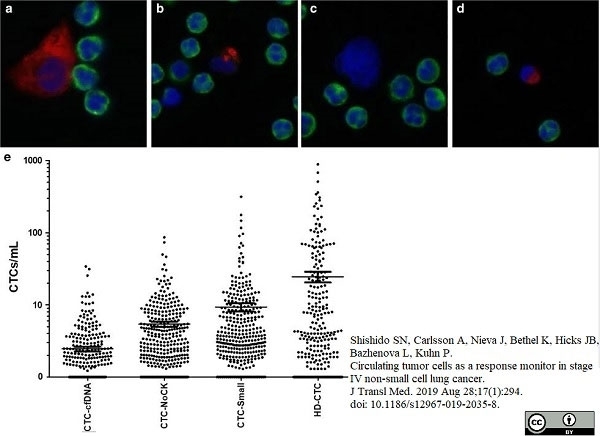 Relocation and characterization of CTCs using the Wright-Giemsa stain. After initial identification of CTCs via fluorescent images, subsequent Wright-Giemsa stain and/or Papanicolau stain of these cells is performed: (a) composite 3-color fluorescent image, (b) DAPI channel only, (c) cytokeratin channel only, (d) CD45 channel only, and (e) corresponding Wright-Giemsa-stained cell. 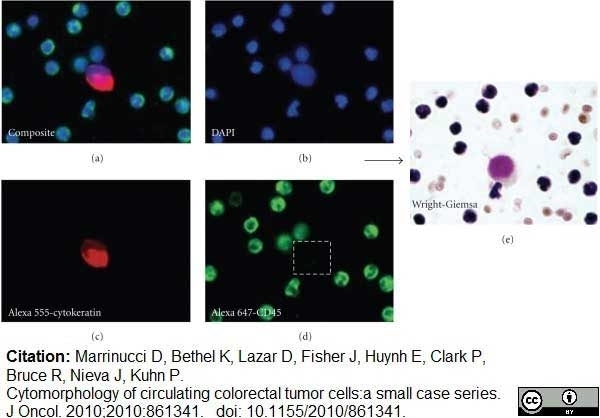 From: Marrinucci D, Bethel K, Lazar D, Fisher J, Huynh E, Clark P, Bruce R, Nieva J, Kuhn P.
Cytomorphology of circulating colorectal tumor cells: a small case series. Representative CTCs found in Patients 1–5. Each column represents one patient's CTCs: Red = cytokeratin, Green = CD45, and Blue = DAPI. 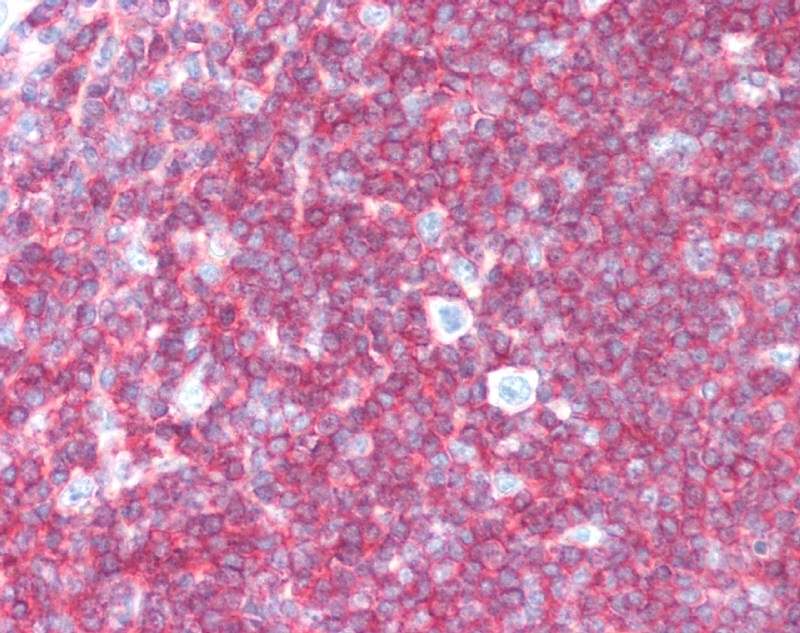 FFPE human tonsil stained with Mouse Anti-Human CD45 (MCA87), biotinylated Anti-Mouse IgG and Streptavidin Alkaline Phosphatase (red). Nuclei were counterstained with hematoxylin. Mouse anti Human CD45 antibody, clone F10-89-4 recognizes the human CD45 cell surface antigen, also known as the leucocyte common antigen (LCA). CD45 is a complex molecule existing in a number of isoforms. Antibodies recognising a common epitope on all of these isoforms are termed CD45 whilst those recognising only individual isoforms are termed CD45RA or CD45RO etc. Mouse anti Human CD45 antibody, clone F10-89-4 reacts with all forms of CD45 expressed by all haematopoietic cells, except erythrocytes, having a higher level of expression on lymphocytes than on granulocytes. 1 This product requires antigen retrieval using heat treatment prior to staining of paraffin sections. 1mM EDTA pH8.0 is recommended for this purpose. EDTA pH8.0 is recommended for this purpose. Dalchau, R. et al. (1980) Monoclonal antibody to a human leukocyte-specific membrane glycoprotein probably homologous to the leukocyte-common (L-C) antigen of the rat. Eur J Immunol. 10 (10): 737-44. Quenby, S et al. (1999) Pre-implantation endometrial leukocytes in women with recurrent miscarriage. Mallam, E. et al. (2010) Characterization of in vitro expanded bone marrow-derived mesenchymal stem cells from patients with multiple sclerosis. Marrinucci, D. et al. (2010) Cytomorphology of circulating colorectal tumor cells:a small case series. Kazane, S.A. et al. (2012) Site-specific DNA-antibody conjugates for specific and sensitive immuno-PCR. Proc Natl Acad Sci U S A. 109: 3731-6. Sadarangani, A. et al. (2015) GLI2 inhibition abrogates human leukemia stem cell dormancy. J Transl Med. 13: 98. Gunawardene, P. et al. (2015) Association Between Circulating Osteogenic Progenitor Cells and Disability and Frailty in Older Persons: The Nepean Osteoporosis and Frailty Study. J Gerontol A Biol Sci Med Sci. pii: glv190. Gogoi P et al. (2016) Development of an Automated and Sensitive Microfluidic Device for Capturing and Characterizing Circulating Tumor Cells (CTCs) from Clinical Blood Samples. PLoS One. 11 (1): e0147400. Bianchessi, M. et al. (2016) Effect of Fibroblast Growth Factor 2 on Equine Synovial Fluid Chondroprogenitor Expansion and Chondrogenesis. Stem Cells Int. 2016: 9364974. Mohamed Suhaimi, N.A. et al. (2015) Non-invasive sensitive detection of KRAS and BRAF mutation in circulating tumor cells of colorectal cancer patients. Mol Oncol. 9 (4): 850-60. Ruiz, C. et al. (2015) Limited genomic heterogeneity of circulating melanoma cells in advanced stage patients. Phys Biol. 12 (1): 016008. Branly, T. et al. (2017) Characterization and use of Equine Bone Marrow Mesenchymal Stem Cells in Equine Cartilage Engineering. Study of their Hyaline Cartilage Forming Potential when Cultured under Hypoxia within a Biomaterial in the Presence of BMP-2 and TGF-β1. Stem Cell Rev. Jun 09 [Epub ahead of print].